On an otherwise neat installation, it appears there is something wrong with the way these ground wires are connected to the support poles of an ice bridge. I am not sure how effective that connection will be if lightning hits anything nearby. 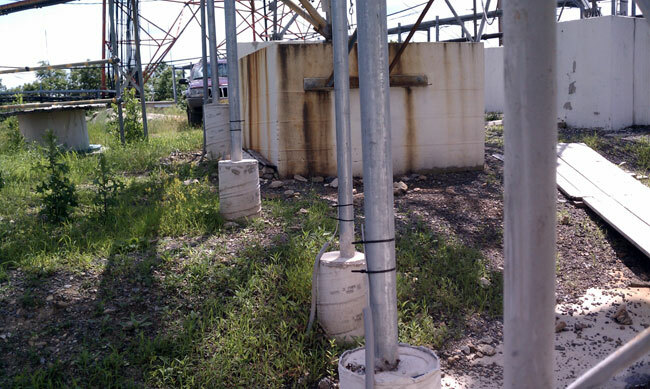 Generally speaking, those wires are CAD welded (exothermic welding) to the support poles or whatever else is supposed to be grounded. I’d bet that whoever packed the truck for the job simply forgot to throw the CAD weld shots on the truck. Now they have to come back. It will be interesting to see how long it takes whatever tower company to return to the site and finish the job.